If you're wondering how to become more efficient when setting tile, consider becoming not just a Certified Tile Installer (CTI), but also going for Advanced Certifications for Tile Installers (ACT). That's what Juan Sauceda CTI #64 who is also ACT-certified did and discovered. 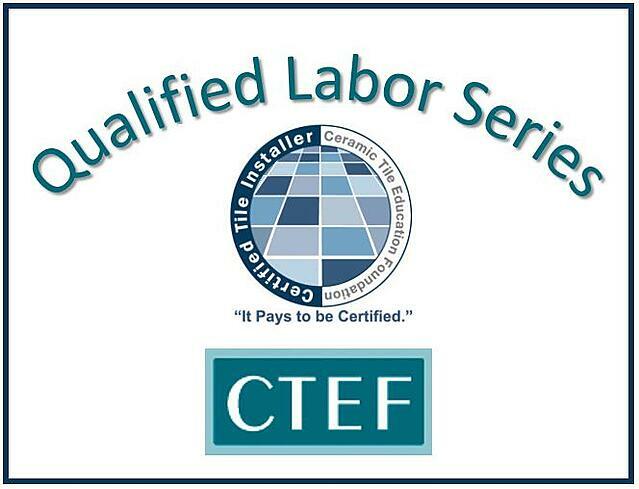 Juan is a superintendent and tile installer for Neuse Tile Service and the next Certified Tile Installer (CTI) to be featured in the CTEF Blog series about Qualified Labor based on articles in TileLetter.com. Juan Sauceda became a Certified Tile Installer in 2007 and continues to learn and improve his tile installation skills. He completed his Advanced Certified Tile Installer (ACT) certification in Membranes and Shower Receptors in 2015. Becoming a CTI and ACT helped Sauceda learn different tile setting techniques that literally cut the time in half it that it took him to do it before. Simply being immersed with other similarly-motivated installers brought increased awareness and appreciation of best practices in tile installation techniques. Talk about increasing your tile installation efficiency! 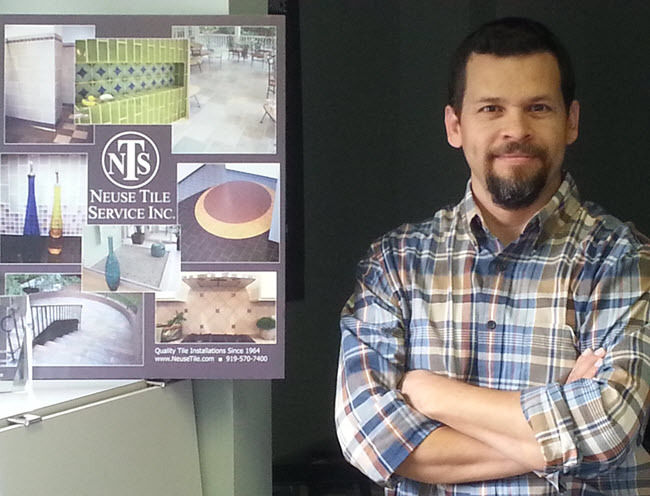 Neuse Tile Service's Juan Sauceda, with a poster depicting many projects that he has either overseen or installed. If you're not familiar with Neuse Tile Service, it is a NTCA Five Star Contractor based in Youngsville, N.C., at the heart of the Research Triangle Park area. Neuse's primary service area is Central and Eastern North Carolina. The company is woman-owned and proudly employs Certified Tile Installers. Paige Smith, vice president, explains that Neuse sends installers to National Tile Contractors Association (NTCA) and Ceramic Tile Education Foundation (CTEF) education programs. The company uses the CTI and ACT credentials everywhere it possibly can and supports tile certification programs in the area through social media, on the Neuse Blog and website and in conversation. It's important for customers to know Neuse's commitment to continuing education. Paige highlights that paying attention to continuing education distinguishes Neuse Tile as a company that cares about its customers and their employees, which hopefully, gives them a leg up over the competition. We caught up with Paige to ask her a few questions. CTEF: Paige, how does becoming a CTI (and eventually ACT) fit into your business? PS: The recognition of CTI or ACT is a real validation of skill and knowledge for our team. Many of our installers have learned the trade working with us, so being recognized with a national certification is a wonderful acknowledgement of their hands-on training. Our customers certainly feel a sense of comfort in knowing that many of our team have CTEF credentials, and it's a good point of differentiation for our business. CTEF: How has Juan’s ACT certification benefited the business? PS: Juan has been with us since 2002 when he came to us with a background in art instruction. He had not been able to find a job in that field, but we felt his attention to detail would be a real asset on our warranty team. His artistic perspective and love of learning have been a perfect combination for the intricacies of a career in tile. Juan is our primary field supervisor, so his expertise is beneficial on every project. He has really embraced the profession and enjoys sharing his knowledge with his co-workers and helping contractors and customers understand the nuances of real craftsmanship. 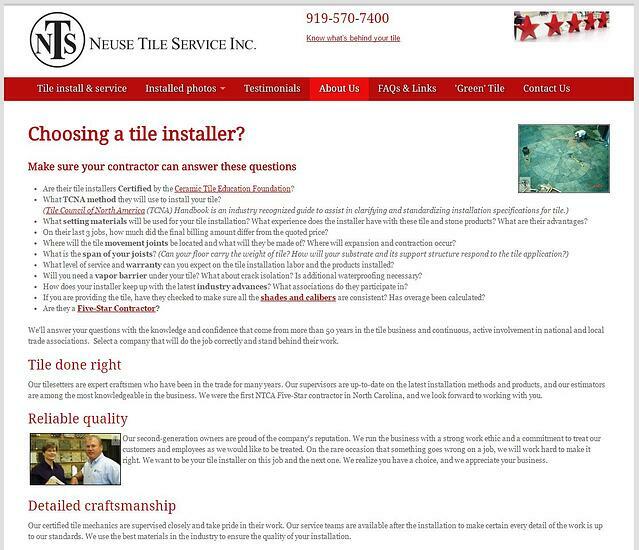 The neusetile.com about us page highlights the importance of working with Certified Tile Installers. CTEF: How long has Neuse been a woman-owned business and how does it differentiate you in your markets? PS: We have been woman-owned since we changed our ownership structure in 2009. As a result, Neuse Tile has gained visibility with general contractors and been invited to bid on more projects. While our status as a woman-owned business has been an advantage in visibility and on being awarded a few projects, it is really our culture as a family-owned business that better defines us. Our employees and our customers understand that we're in this journey together so we feel a real sense of ownership in making sure things are done well. Ready to Improve Your Tile Setting Efficiency? Are you ready to become a more efficient tile installer? Consider become a Certified Tile Installer. If you're already a Certified Tile Installer, how do you promote your certification? Have you considered the ACT? Why? Why not? Let us know in the comments.